BICD2 is the second human homolog discovered to the Drosophila Bicaudal-D protein that forms part of the cytoskeleton and mediates the correct sorting of mRNAs for oocyte- and axis-determining factors during oogenesis. Similar to the highly homologous protein BICD1, BICD2 can bind to dynein-dynactin complex, primarily through the dynamitin subunit of dynactin. The C-terminus of BICD2 targets the protein to the Golgi complex while the N-terminal domain of BICD2 co-immunoprecipitates with cytoplasmic dynein, suggesting BICD2 plays a role in the dynein-dynactin interaction on the surface of membranous organelles. Mice engineered to overexpress the BICD2 amino terminal domain in neurons developed amyotrophic lateral sclerosis (ALS)-like features such as Golgi fragmentation, neurofilament swelling in proximal axons, etc., suggesting that impaired dynein/dynactin function may explain some of the pathological features observed in ALS patients. 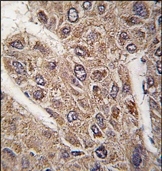 Formalin-fixed and paraffin-embedded human hepatocarcinoma tissue reacted with BICD2 antibody (C-term), which was peroxidase-conjugated to the secondary antibody, followed by DAB staining. Western blot analysis of anti-BICD2 Antibody (C-term) in K562 cell line lysates (35ug/lane). BICD2(arrow) was detected using the purified Pab. Western blot analysis of BICD2 in A-549 cell lysate with BICD2 polyclonal antibody ( Cat # PAB13387 ) at ( A ) 1 and ( B ) 2 µg/ml. Western blot analysis of BICD2 in A-549 cell lysate with BICD2 polyclonal antibody ( Cat # PAB13388 ) at ( A ) 1 and ( B ) 2 µg/ml. 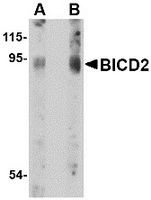 Western blot analysis of BICD2 in A549 cell lysate with BICD2 antibody at (A) 1 and (B) 2 µg/ml.